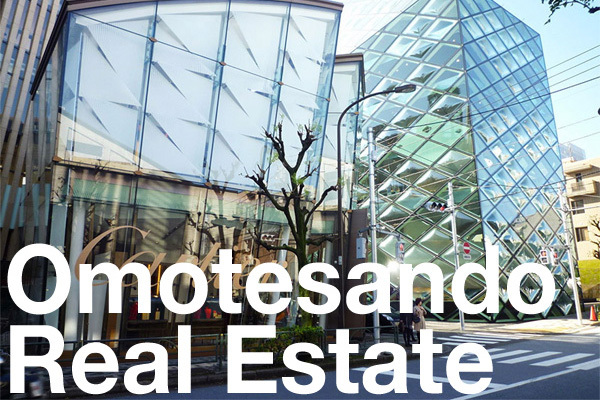 Approximately 0.5% of Japan’s total area is estimated to be reclaimed land, or umetatechi. Some reclamation projects began as early as the 12th century, but it was post-WWII when the majority of land reclamation was undertaken. During Japan’s period of rapid economic growth following WWII, approximately 80~90% of the country’s tidal flatland was reclaimed. 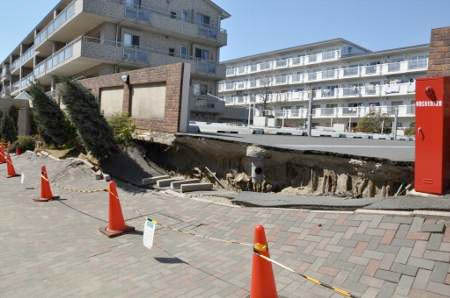 The March 11 Tohoku earthquake caused serious damage to some reclaimed areas, in particular Urayasu City in Chiba. 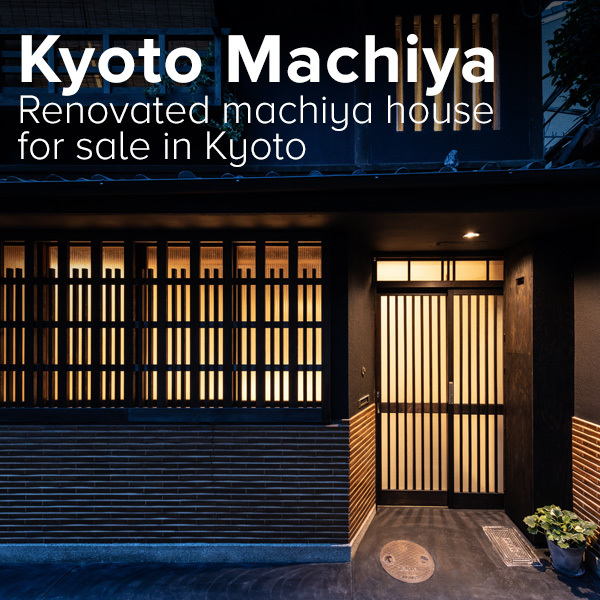 This has led many Japanese to place a high priority on purchasing properties on safer and more solid ground. 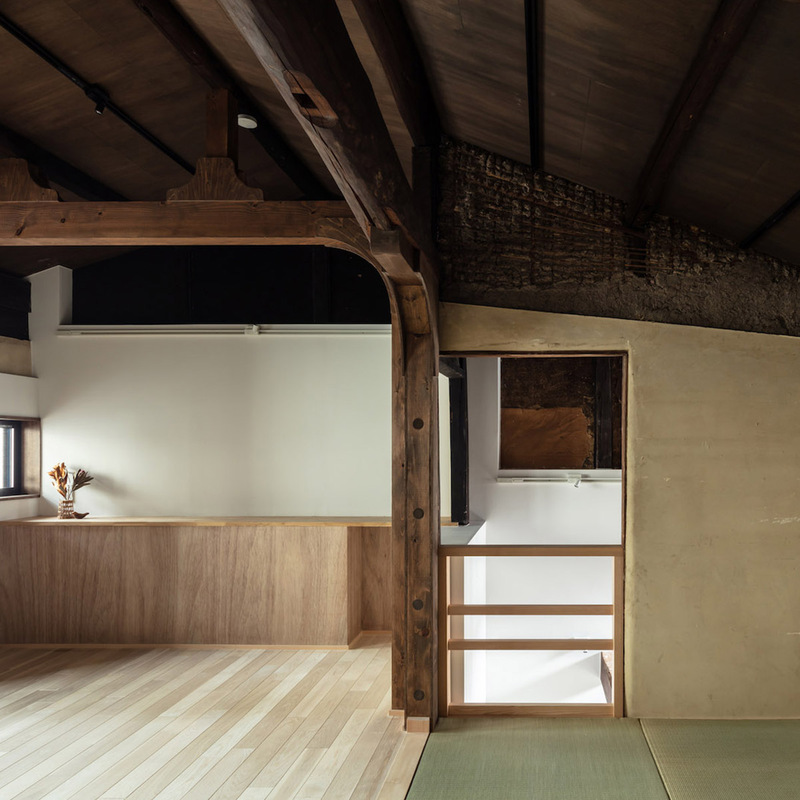 Before buying a house or apartment, Japanese are now thoroughly researching the area to determine the strength and safety of the ground. While high-rise apartments on man-made islands did not suffer structural damage, the underground water and gas pipes ruptured during the earthquake which left many residents without water, sewerage or gas services. Reclaimed land is made up of landfill from waste materials, sand from dredging, soil removed from construction sites. It is not just used to create man-made islands in harbors, but is also used to make embankments in inland areas, so even some inland areas can be at risk of liquefaction. Recently, Tokyo City began accepting rubble and waste from the tsunami affected regions in Tohoku. This rubble will be processed and, provided it is under the imposed radiation levels, will be used as landfill to create new man-made islands Tokyo Bay. This has prompted an outcry from local residents who are concerned about possible contamination. Reclaimed land and man-made islands are particularly susceptible to liquefaction during an earthquake. As a result, there are specific earthquake resistance standards and ground reform work that applies to all construction in these areas. In an area that was possibly reclaimed in the past, old maps and land condition drawings are checked and drilling is carried out to determine the strength of the ground. However this can be very costly, so for a private residential block of land, a swedish weight sounding test is more common. During Japan’s post-war economic miracle, various coastal areas across Japan undertook vast land reclamation projects to house maritime and industrial factories. This included Osaka Bay, Higashi Ogishima in Kawasaki and Nagasaki Airport. Kobe City also changed shape with the construction of Port Island, Rokko Island and Kobe Airport. 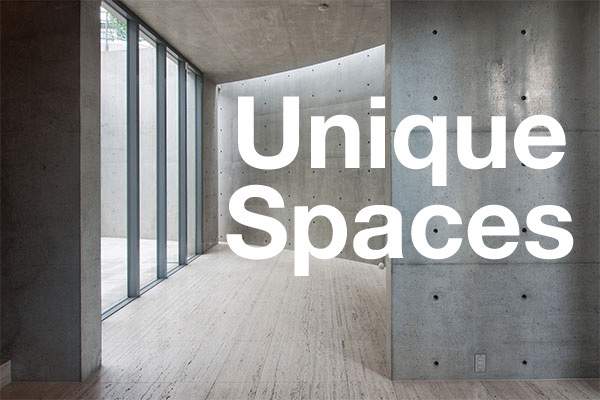 Recent projects have included Kansai International Airport (which is sinking at a rate of 7cm a year), Yokohama’s Hakkeijima and Wakayama Marina City. The first man-made island in Japan was Kyogashima in Kobe. The island was built by Tairano Kyomori in 1173. At that time, Kobe Port was already used to trade between Japan and other countries. Superstition at the time dictated that a human sacrifice be made to appease the sea gods, but Kiyomori decided instead to bury stones carved with scriptures. Further reclamation has since changed the landscape, but it is believed that the island lay somewhere between Wadamisaki Station and the Hanshin Expressway No. 3 Kobe Route in Hyogo Ward. 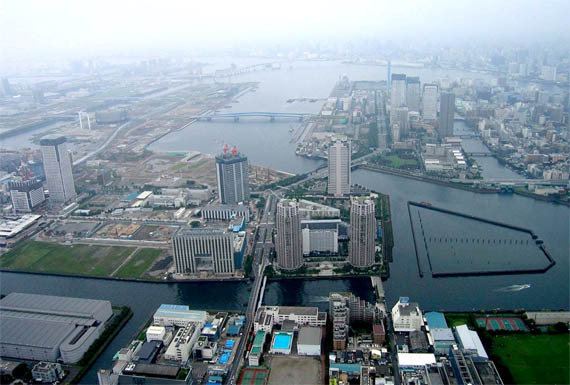 The first large-scale reclamation project was the Hibiya Inlet which began in 1592 in Tokyo. 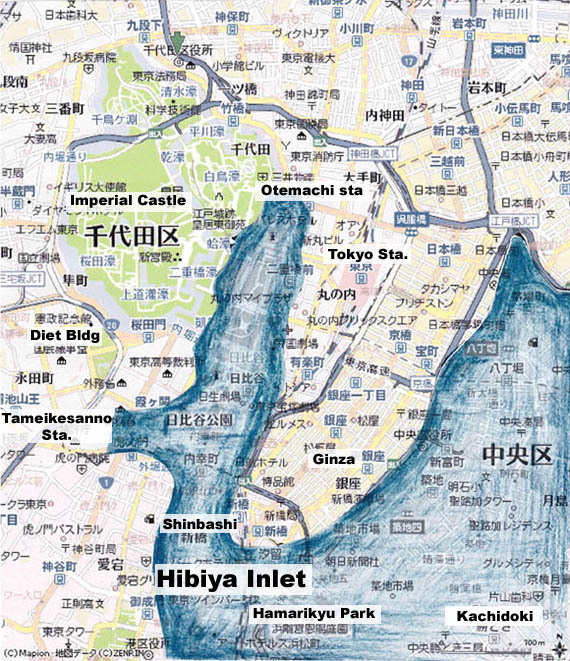 The entrance to the Hibiya Inlet (Hibiya-irie), is located near Shinbashi and extends right up to the Imperial Castle. It is said that ships were once able to sail right up to the Castle. Once the land was filled in, it was the home to many Daimyo (Japanese feudal lords). In 1634, a man-made island was built in Nagasaki. 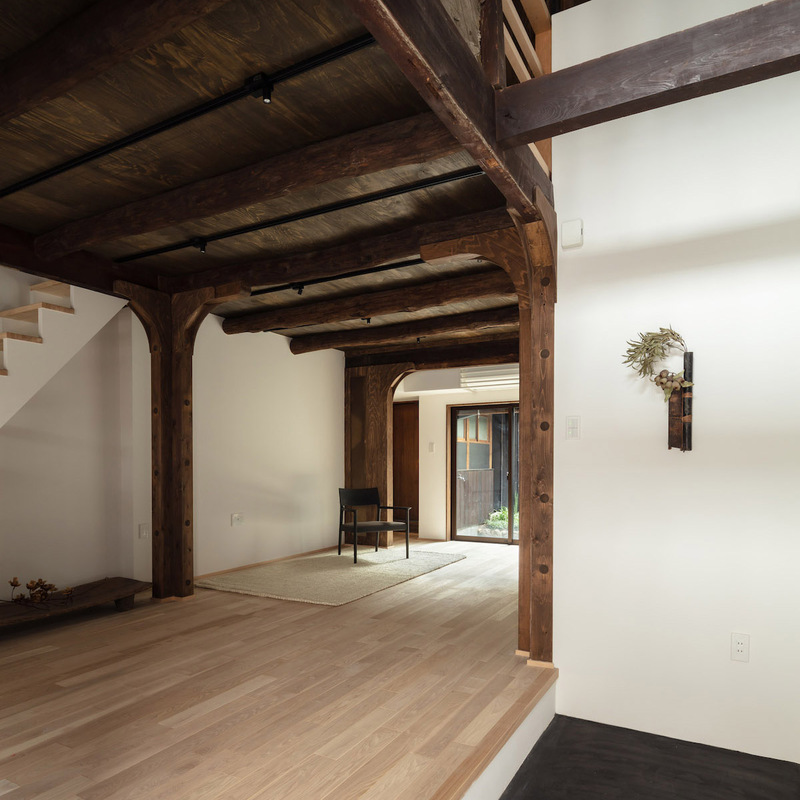 “Dejima” was built during Japan’s national isolation period (called Sakoku). The island was the sole trading post in Japan during the Sakoku period and was originally inhabited by Portuguese and then Dutch traders. The island is a national historic site and efforts have been made to preserve the history of the area. 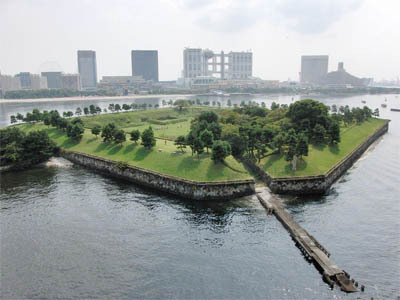 A series of island forts constructed in Tokyo Bay to protect the city from sea attacks. The forts were constructed using land from leveled hills in Takanawa. Damage from the March 11 earthquake to Gran Mare Yokohama Hakkeijima in Kanazawa-ku. Many land reclamation projects have used waste and garbage in their construction. One example is Yamashita Park in Yokohama City which was constructed using rubble from the 1923 Great Kanto Earthquake. Commonly used landfill includes waste, sediment, sludge, dredged earth and sand. Sometimes toxic substances have been detected in the landfill. There is a high tendency for contamination to occur on man-made islands and reclaimed land that was once used by heavy industry that released chemicals into the ground. The biggest example of soil pollution is on the man-made island near Toyosu where Tokyo Gas once had a factory. Highly concentrated chemical substances were detected in the soil on the planned site for the new Tsukiji Fish Market. Smaller cases of contamination can be found in various sites. This led to a rapid expansion of the soil-decontamination industry from 1998. When buying or selling land that has been identified as a potentially contaminated area, the sales contract must specify this. However, not all areas have been identified so it is recommended that the purchaser undertakes their own soil tests prior to purchase. From November 8, 2011, Tokyo City began accepting rubble from the Tohoku disaster. This rubble will be processed at various incinerating plants in Tokyo and, provided it is under the imposed radiation levels, will be used as landfill to create new man-made islands Tokyo Bay. Cesium levels will be measured twice – once before it leaves the depot in the Tohoku region, and once when it arrives in Tokyo. 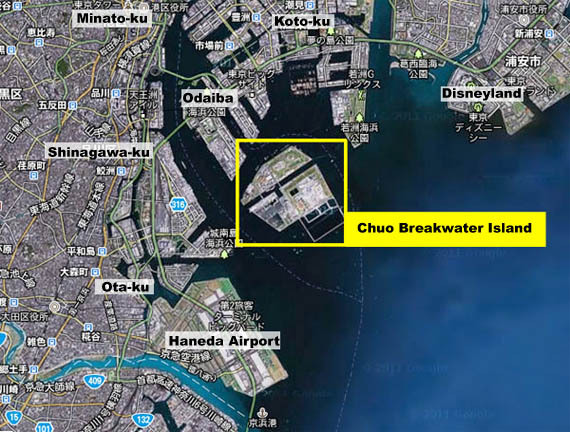 If the levels are below 8,000 becquerel per kilogram, it will be disposed of in the Chuo Breakwater Island in Tokyo Bay (a new island just south of Odaiba). Tokyo will be accepting 500,000 tons of rubble from Iwate and Miyagi Prefectures until the end of 2013.